Chelsea Green Publishing Company, 9781603586399, 320pp. Elizabeth Marshall Thomas has spent a lifetime observing other creatures and other cultures, from her own backyard to the African savannah. Her books have transported millions of readers into the hidden lives of animals--from dogs and cats to deer and lions. She's chronicled the daily lives of African tribes, and even imagined the lives of prehistoric humans. She illuminates unknown worlds like no other. Now, she opens the doors to her own. Dreaming of Lions traces Thomas's life from her earliest days, including when, as a young woman in the 1950s, she and her family packed up and left for the Kalahari Desert to study the Ju/Wa Bushmen. The world's understanding of African tribal cultures has never been the same since. Nor has Thomas, as the experience taught her not only how to observe, but also how to navigate in male-dominated fields like anthropology and animal science and do what she cared about most: spending time with animals and people in wild places, and relishing the people and animals around her at home. Readers join Thomas as she returns to Africa, after college and marriage, with her two young children, ending up in the turmoil leading to Idi Amin's bloody coup. She invites us into her family life, her writing, and her fascination with animals--from elephants in Namibia, to dogs in her kitchen, or cougars outside her New England farmhouse. She also recounts her personal struggles, writing about her own life with the same kind of fierce honesty that she applies to the world around her, and delivering a memoir that not only shares tremendous insights, but also provides tremendous inspiration. 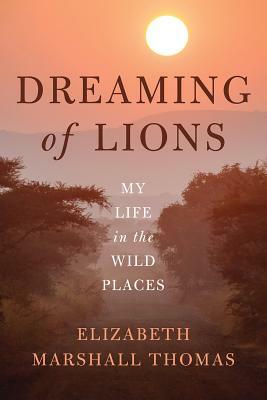 Dreaming of Lions, originally published in hardcover as A Million Years With You, is slightly updated and includes a powerful new afterword by the author.